10 Years of Typepad Blogging Contest: Congratulations to our Winners! When we announced our special 10th Birthday Blogging Contest, inviting Typepad bloggers to write about why they blog, and how blogging has changed their lives, we never expected to receive so many touching, inspiring, and thoughtful entries. We won't lie - judging this contest was tough! The three winning posts are heartfelt, passionate, and really express what blogging with Typepad is all about. We're sharing their stories with you today, both to celebrate them as winners, and in hopes that they will inspire our other bloggers as much as they have inspired us. Blogging pushes me to look for beauty in the moments of my life. I find myself looking at life with an editor's eye. While this sometimes means that I turn a blind eye to (or at least omit from my blog posts) the less "pretty" bits of life, it also means that I am particularly sensitive to all of the wonderful blessings that surround me. Blogging encourages me to be a self examiner. It feels a bit like therapy (or what I imagine therapy would feel like). I write a lifestyle blog and that means that I get to dole out little pieces of my life on a daily basis. Every day I consider what to share. What's better than big doses of self examination? Turning them into presentable pieces of writing. It is one thing to take time for reflection and quite another to put those reflections into words. It is a process that I am still learning, but I feel like it is taking me somewhere. Somewhere good. Women everywhere have always talked about motherhood and connected with a common bond; in the produce aisle at the grocery store, in the waiting room at the pediatrician’s office, the hair salon, and thanks to blogs and online communities.. on our laptops and Ipads. We are experiencing moments of affirmation, understanding, even comfort if that is what we seek and it’s happening when we share our stories. I love that blogging has gotten me to do things that I normally wouldn't have done. Held me accountable to challenges I've created for myself. Done things so that I can share. It makes me get up an hour earlier to go take pictures at the beach on a Monday morning on a clear, beautiful Southern California day. How I can have a case of the Monday's when my Monday includes going to the beach? It makes me think of projects and recipes I'd like to try, DIYs to share and probably the most significant thing, forced me to be okay with taking pictures of myself. Because we received so many wonderful entries, we extended the contest and selected three special Honorable Mentions. These folks will receive a Typepad t-shirt along with a month of Typepad service. Remember, everyone who entered will receive a free month of Typepad service, and we'll be applying those credits today. We'd like to express our thanks to everyone who entered the contest, and everyone who reached out via email, Twitter, and Facebook to let us know how blogging has touched your lives and how proud you are to blog with Typepad. We know that we're the real winners, here - we can't thank you enough for blogging with us, and we can't wait to see what the next 10 years will bring. You've got a blog, you're starting a shop, but how to integrate the two? If you haven't started by first comparing the eCommerce solutions out there, then by all means finish reading this post before you do so; it may just save you some time and heartbreak. And while we don't natively offer eCommerce, we make it easy for you to integrate your preferred eCommerce solution with your Typepad blog, provided you use the right service. Review and compare the shops that look like they'll fit your needs. Now check whether or not they allow you to embed the store, or your items, elsewhere. Do they? Rad! If they don't, then it's best to not move forward with them. So, your shop is all setup and you're ready to add it to your blog. There are a few ways this can be achieved, and it all depends on the options your chosen service provides. This option will display your shop widget on all posts and pages of your blog. Copy the code provided to you from your selected service, then use either a Notes Typelist (add | publish) or an Embed Your Own HTML module, pasting the code into whichever of the two you choose. Code pasted? Excellent job! Now save and publish your changes. Depending on the layout used for your blog, embedding your shop on its own page may be a bit cumbersome. Lucky for you that we've covered this topic in the past, right here at Everything Typepad! It's the ideal solution for you if your shop doesn't seem to be fitting within the given space very well. As with the earlier embed option, you'll need to copy the embed code that your selected service provided. Once copied, compose a page (Compose > New Page), then click the HTML tab of the editor. Paste the code into the page, then click Publish, making certain that the HTML is still visible (returning to the Rich Text tab could corrupt your shop's embed code). Once published, click the "view page" link to make sure it looks the way it needs to. If your shop service provides you customization options to narrow or widen the content, you can use that to make the shop better fit the space available. If it does not, however, use the CSS tip provided in the article linked above. Make sure to follow the directions carefully. You can copy the URL of the page you published, then add it to your blog's navigation bar so readers can quickly, and easily, access your shop content. Does your selected service allow you to embed specific shop items? That's pretty cool! Being able to embed a specific item means that you can include it, via the HTML tab, in a blog post when you are looking to feature a product to your readers. Similar to creating a page, for embedding a specific item, you would copy its embed code, then compose your blog post as you normally would. Once finished, click the HTML tab, then paste the code into the location you'd like it to appear. Preview the post to verify that it looks the way you want, then share it with the world! Now that you've got the rundown on how to embed your shop, you're one step closer to getting it up and integrated with your blog. Your readers are going to love having such easy access to your wares, man. All the other bloggers will be totally jealous. Ready to share your shop with other Typepad bloggers? Make sure to visit and submit your shop link to shop.typepad.com! You may already be familiar with the Other Accounts module - it pulls the profiles you have listed in Accounts > Other Accounts into a little grouping of links in your blog's sidebar. You can even use your own custom icons with CSS if you'd like. 1. You'll need an icon set that includes all of the services you want to link. There are about one zillion sets like this available, the key is finding one that you like and complements your blog's design. Google lists millions of results for free social media icon set, so there's no shortage of options! Download and unzip the set on your computer, making sure to check it has all of the icons you need. Happy 10th Birthday, Typepad; Have a Theme! Loft is a modern theme, trimmed down to the essentials, for those of you who like to show off your images. Take advantage of the full width of the theme (1000px) to showcase your work, be it text or photographs, and enjoy how pulled together it appears when published. Like to add captions to your images? With Loft, your captions will sit directly on the image, positioned at the bottom with a script font and transparent dark gray behind the text. This lets your words pop, without detracting from the image; instead, it stages the image for a very sleek and professional look. The theme comes with three color variations--Brick, Mustard, and Boho Light--to help support your content, not fight with it. Interested in seeing additional color options of this theme? Why not visit this theme's community forum thread and submit color palettes you'd like to see offered? You can choose to help others if they're struggling with their color palette, or submit your own palette ideas. We will then look into offering those options for Loft in the future. Either way, it's a big win for you and your fellow bloggers! Welcome to our series of posts on the business of blogging! Each Thursday for 6 weeks, we'll debut a new post designed to help you build, market, and successfully create a small business with your Typepad blog. This week, as part of our 10th Birthday Celebration, we're taking a look at some great bloggers who use Typepad to promote their small businesses. We hope they inspire you as much as they inspire us! In the Typepad Gift Shop, you can find everything from arts & crafts to e-courses, which is exactly what you'll find with Elise Blaha Cripe's Elise Joy Workshops. Elise, who authors the personal & craft blog enJOY it, started offering online scrapbooking workshops in 2009. Her classes are organized into daily lectures, many with helpful videos, that are insteresting and easy to understand. The classes are hosted on a private blog and are meant to be completed at your own pace. Throughout the workshops, she is available to answer any questions and provide clarification. At the end of each workshop, PDFs of class lectures are available for download. In addition to offering workshops and blogging about her life, Blaha can also be found offering valuable insight about what it's like to run a small business. Marc Johns' drawings are famous. Chances are, you've seen them all over the Internet, inked onto peoples' bodies, and perhaps, framed in your own living room (signed originals and other prints can be purchased in the shop). Whimsical and marvelously witty, his illustrations of pipe-smoking rabbits, lightning bolt-emblazoned cats, and birds who prefer to travel via hot air balloon have been exhibited in New York, San Francisco, Los Angeles, Vancouver, Athens, and just about everywhere else. 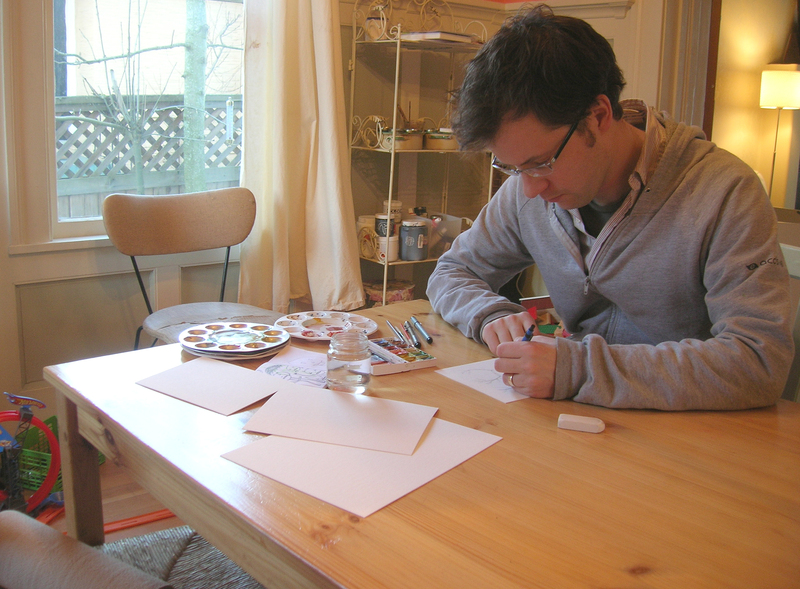 Johns blogs about his drawings daily at Marc Johns: Serious Drawings. 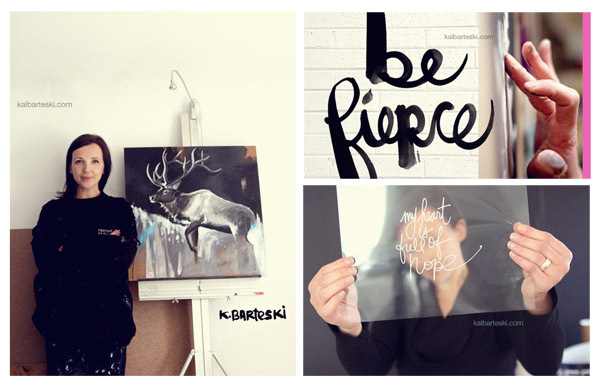 Kal Bartestki is a professional artist who specializes in painting, writing, design and keeping life inspired with her Bulletproof Positive Attitude. She sells her work internationally and keeps a daily journal at [i] LoveLife. Her ARTshop and online gallery can be found here. A published author and winner of a Women Entrepreneur of the Year Award, she is a creative powerhouse and inspiration. Living the life she imagined - she is passionate about art and artists. When she is not elbow deep in paint she is busy speaking about art, creativity and the effects of creativity. Based in Seattle, jewelry artist and photographer Rachel Ball runs a lifestyle blog, Elephantine, which features gorgeous photos, daily inspiration, food videos, and fiction. Add a popular Etsy shop of the same name which features gorgeous, modern everyday jewelry, and a kitchen shop called Mignon Kitchen Co. to the mix, and you've got a recipe for a charmed life. With a background in graphic design, Ball is particularly adept at capturing the beauty in simplicity. Emily Winfield Martin makes paintings, books, and other things. She is the author and illustrator of a paper doll epic called "The Black Apple's Paper Doll Primer" and an illustrated novel for children, "Oddfellow's Orphanage". When she was small, she spent every moment drawing, reading, dressing rabbits in fancy clothes, and having many peculiar daydreams. When she grew up, she began to illustrate those peculiar daydreams, and in 2005, she created a cottage industry called The Black Apple on Etsy, which sells all manner of art and etceteras. She blogs about her art and daily life on (Inside A Black Apple). Check out other posts in our Business Blogging series here! By default the Clean Theme, rounds the corners of photos uploaded to your blog posts. Maybe you want the same style but you're using a different theme. It's really easy to add the same rounded corners to most other themes and the custom themes by adding a few lines of CSS. To achieve the look of the image above, go to Design > Custom CSS, enter the below code in the text field, and click Save Changes. You can adjust the 10px to increase or decrease the curve of the corners. Now that was easy! All the photos in your blog posts will be updated with the stylish rounded corners. Don't have the Custom CSS feature? Upgrade to the Unlimited plan at Account > Billing Info > Upgrade/Downgrade. More tips like this one are available in the CSS Cookbook. Want to know how to make other design changes with CSS? Ask the Typepad community in the Typepad forum. As part of our 10th Birthday celebration, we're highlighting some great Typepad bloggers. Today's post is brought to you by Alex Sirota, Founder and Director of NewPath Consulting. His 20+ year career has endowed him with a keen understanding of the challenges and needs of small businesses, enabling him to establish a strong professional network of industry leaders committed to supporting and strengthening the small businesses that create the backbone of the world’s economy. Learn more here. "Design is a funny word. Some people think design means how it looks. But of course, if you dig deeper, it’s really how it works. The design of the Mac wasn’t what it looked like, although that was part of it. Primarily, it was how it worked. To design something really well, you have to get it. You have to really grok [understand] what it’s all about. It takes a passionate commitment to really thoroughly understand something, chew it up, not just quickly swallow it. Most people don’t take the time to do that." Steve Jobs' words ring true today more than they ever did. We heard these words and acted on them during the NewPath Consulting website and blog redesign that launched last week. NewPath Consulting hired a savvy young designer, Philipp Schöfer, so we could work to create a Typepad site like no other we have seen. The result is what you see: a beautiful (we think), small business site and blog that is easy to maintain, even though the standard design editor is not used anymore. This is a custom site that even your clients can maintain without messing up the advanced templates! People ask us why we used Typepad over other popular content management systems. We have been customers since August 2004 and are loyal, but we had our doubts about whether Typepad could be used to design a highly flexible website with advanced features. We could always say that Typepad's ease of use and superior customer service kept us going all this time, but now we can proudly say that we can design beautiful, easy to maintain, custom designs affordably with Typepad. The website is implemented using responsive web design. Most importantly, the website is easy to maintain, even though it is an Advanced Template design. WHY YOU'LL LOVE IT: A Beautiful Mess is a lifestyle blog focused on creating a beautiful life. Sisters Elsie and Emma share simple ways to create an inspired lifestyle. They believe in taking time each day to make something pretty, in lifelong learning, and that life doesn't need to be perfect to be beautiful. It started with two kids and a dream (and a lot of hard work), and now Typepad is celebrating a decade of making it fun and easy for you to blog your passions and share with the world. Our bloggers have always been the heart and soul of Typepad, and we can't thank you enough for blogging with us. You rock! Everyone knows the best part of a birthday party is the cake the presents, and as our way of saying thank you for making the past 10 years so awesome, we have a few gifts for you! All week, we'll be doing things like posting about our favorite bloggers, sending out a particularly celebratory newsletter, releasing a spanking new (and super fantastic) Theme, and - last but not least - giving you the opportunity to win some celebratory swag with a blogging contest! 2. Why you blog with Typepad. That's it! Your post can be long or short, funny or serious, full of photos or full of memories - just make sure it reflects your passion, and that you hit the two points above, then share the post on your favorite social networking site (Twitter, Facebook) and email the link to your post to hello@typepad.com by Midnight PST on June 24, 2013. Your posts will be read by a panel of esteemed judges (the Typepad team), and three winners will be selected. First place: A rockin' Typepad t-shirt, a $50 Amazon gift card, and 6 months of Typepad service. Second place: A rockin' Typepad t-shirt, a $25 Amazon gift card, and 3 months of Typepad service. Third place: A rockin' Typepad t-shirt, $10 Amazon gift card, and 2 months of Typepad service. Honorable Mention (that's everyone! ): 1 month of Typepad service. Contest deadline is Midnight PDT on June 24, 2013. That gives you one full week to write up your post and polish it to a fine gleam of literary greatness (no pressure!). The post must appear live on your Typepad blog. To enter, just email hello@typepad.com, and include your name and the direct link to your post. Prize packs will be awarded to the first, second, and third place winners, and all entrants will receive one month of Typepad service for free. After Google discontinued support for the FeedBurner API last year, we here at Typepad have looked for ways to bring similar functionality back. Luckily, we have found the perfect partnership with FeedBlitz. FeedBlitz makes it easy to add all kinds of additional functionality to your feed. You can track how many subscriptions you have, integrate with your existing Google Analytics account, works better for SEO functions, place advertising in your feed to make some additional money, and even send out automatic e-mails with new posts to your subscribers. You can even import in a FeedBurner feed. Best of all, as a Typepad subscriber, this new partnership allows you to sign up for FeedBlitz for 50% off. This means that you can take advantage of their service starting as low as $0.75 a month. There's even a free 30 day trial to give you a chance to try it out. You can read more about FeedBlitz and find out if it's a good fit for you here. To connect your blog to FeedBlitz, first create a new FeedBlitz account or log into your existing account. Follow the steps to either create a new feed or import your FeedBurner feed using their easy walk-through process. Once you've created your feed, go to Settings > Feeds within Typepad, click the "Connect to FeedBlitz" button, enter your feed's URL, click Save, and you're done. Easy as pie. If you have any questions or need anything at all, FeedBlitz has their own support pages or you can always open a help ticket from within Typepad. We're always here to help.